Perhaps we should not place so much emphasis on demanding a vote on the "final deal". not even intend to. It's quite possible she intends to delay until we crash out of the EU with no deal at all. there can be no excuse for our feeble negotiators to continue with their charade, and no reason why EU negotiators should waste any more of their time on such a fraudulent farce. May's Article 50 letter should be withdrawn, now. cannot continue with this absurdity. As the #A50challenge has irrefutable arguments that we have not even made a constitutionally valid decision to leave, unless Parliament does make such a decision, we must #RemainInTheEU anyway. Hello, @threadreaderapp - here's another one for you to unroll. Right now, there are lots of MPs saying they want to #StopBrexit, but don't think there's a way do do it using existing Parliamentary procedures. And guess what? You can do that as well. Stop being terrified of the ugly woman with the gigantic necklaces, for a start. ...PM and her gang are trying to force on you. Tell Mr Speaker, you have all decided to have a vote on whether to leave the EU or #RemainInTheEU. Refuse to do anything else, for as long as it takes for him to agree with your demand. Then vote. Remember, Parliament is sovereign. Most MPs are useless party drones, collecting their pay and expenses, and voting the way they are told to. ...the UK should leave, or #RemainInTheEU. That, as far too few MPs will admit, is their job. They should make decisions on our behalf. 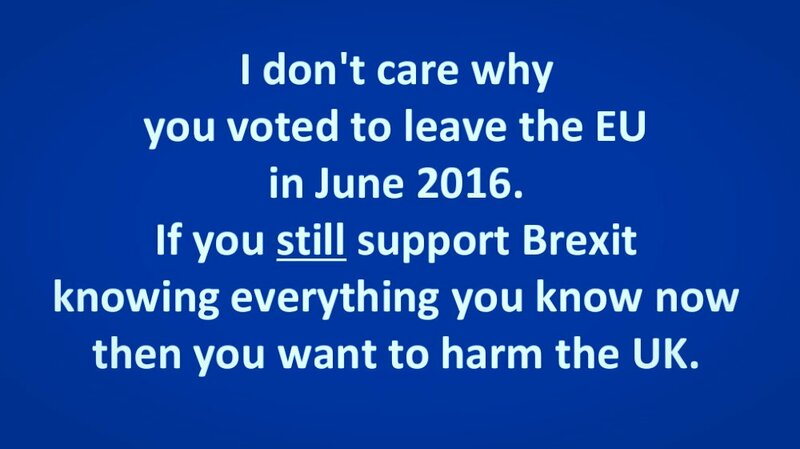 The majority of them know we should not leave the EU, because they know how much harm it will do to everyone but a few very rich people. About 400 MPs think we should #RemainInTheEU, but most of that 400 think that hanging on to their seat, no matter how much harm they do, is the best thing to do. Because pay and expenses matter more to them than we do. Because they are scared of the whips. People keep saying we should have a vote on the #Brexit "final deal". I don't think we should wait. Why not? repairing the damage that #Brexit has already done, which is considerable, and carry on with improving things for all Europeans. aimed at that result, including trying to extend MP's extremely long holidays, to prevent them from stopping her crazy game. I think we can't get Parliament recalled, as the usual way to do that would need the Government to ask the Speaker, and May won't allow that. 1.This is a thread for my fellow Remainers in the #fbpe movement. There were some threads yesterday which have caused upset in our community and a shaking of people’s confidence. Well I awoke his morning with these thoughts on my mind and wanted to get them down on paper. 2. We have the privilege of having some excellent specialists in their fields fighting by our side, I thank each and every one of them. But it is by THEIR SIDE. They know the technocratic stuff and understand the legalities of treaties and trade deals. 3. But all of that on it’s own is not what will get us a peoples vote and our personal opinions, worldview and knowledge and experience should hold equal weight when considering our own positions. 1. There is a new twist in the Brexity disinformation black ops playing out on Twitter. It appears to be imported from Trumpkin America, where similar efforts to divide the anti-Trump 'resistance' have been quite successful. 2. I first became aware of attempts to divide the anti-Brexit movement back in the late summer. It began with an approach by one 'Barry G's Ghost' - a supposed anti-Trump Republican who was now turning his/her/their attention to Brexit Britain. I played along, to learn more. 3. 'Barry' made a slightly cloak and dagger approach to me via DM, with 'information' concerning certain high profile anti-Brexit accounts.